At the age of 18, most people are usually just finishing up their senior years of high school and are looking toward college. It is the same for Maame Biney; she has just finished her high school education, graduating from South Lakes High in Reston, Virginia, and is off to the University of Utah. But there is one more thing that sets her apart: She is an Olympic short-track speedskater. 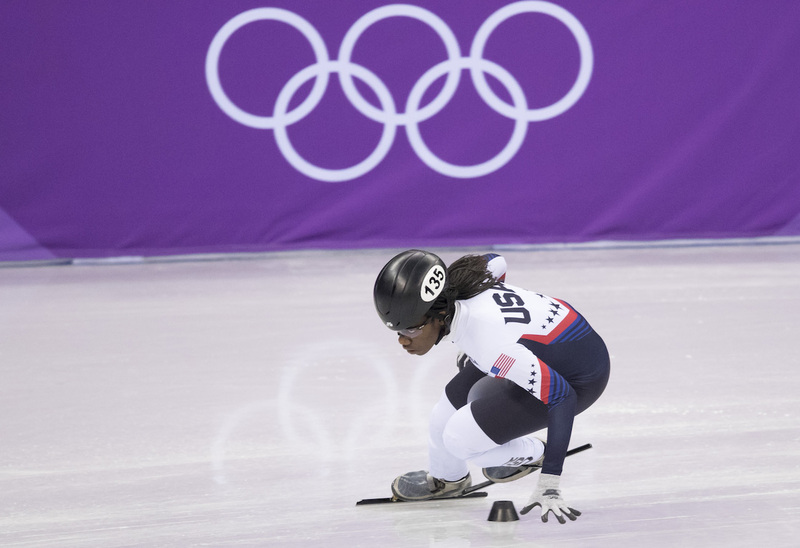 Biney finished first in the 500-meter short-track event at the 2017 U.S. Olympic trials to become the first African-American female speedskater to make Team USA. At the 2018 Winter Olympics in Pyeongchang, South Korea, she finished 14th in the 500 meters and 31st in the 1,500. In March, Biney placed first in the 500 at the ISU World Junior Short Track Championships in Poland, winning by more than half a second. 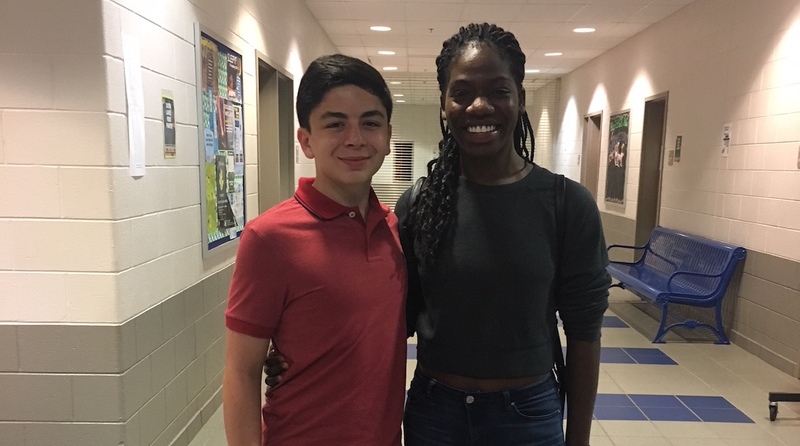 I caught up with Maame last month while she was visiting South Lakes to talk about her career and life outside speedskating. What made you fall in love with speedskating? I first started skating when I was five, and my figure skating coach told me to try speedskating. I went to DC-ICE (a skating club in Washington, D.C.), and the reason that I kept coming back was because he kept telling me I was well-dressed, but all I had was purple overalls and I loved the compliment! How has your relationship with your dad helped you in school and in sports? Did you always specialize in speedskating or did you try other sports? I tried gymnastics, soccer, and dancing; that didn’t really work out, so I stuck to speedskating. Were there any times in your life where you thought about quitting skating? What helped motivate you to keep going? I had multiple times when I wanted to stop skating, but my dad was one of the main reasons I kept going because he motivated me in a way that wasn’t pushing, he wasn’t mean about it, and I stopped skating for a few weeks and realized that I really liked it and I kept with it. What were your initial feelings after you realized you had qualified for the Olympics? ‘Holy cow, I’m on the team, holy moly.’ That’s one moment that I’ll never forget. I won my distance, went a lap and then another lap and high-fived my coach, and the moment we touched I realized that I’d made the team. Describe your time in South Korea. Were there things that surprised you? I had been to South Korea before, but I think the one thing that surprised me were the apartments [in the Olympic village]. I thought it would just be like a hotel room but it wasn’t; it was really big! Are there any experiences that you remember specifically from the Olympic village? Probably eating with my teammates, talking, having fun, and being in the environment of the Olympics. Even though you did not medal at the games, how will your experience help you in the future? I like to expect things; I like to know what’s ahead of me, and the Olympics weren’t what I expected. Everything was rushing, and I didn’t have a lot of time to soak it in. Since I know what’s happening next time, [it should be easier]. In an interview with NPR you described yourself as “fierce” and “strong.” How do those traits help you on the rink? Being fierce and strong is something I still have to work on, but it helps because you can’t be weak. It’s sort of a Hunger Games kind of thing where you can’t be weak or vulnerable because people will take advantage of that. You always have to be strong. As you have committed to the University of Utah, do you plan to race for the Utes and Team USA? I do; it’s definitely going to be hard, but I’m excited about the next four years! How do you plan to balance academics and sports when you are training or at a competition? I’m going to be in college instead of high school, and at a high level, so that’s going to be something I’ll have to figure out between me, my coach, and my counselor. While I was training in Utah I was doing online school, and that was a little easier, but it was still really difficult at the same time. I know you are interested in chemical engineering. Will you focus on it at the University of Utah? For the first year [of college], I’m going to go undecided and try and venture out more because I don’t want to only focus on chemical engineering. It’s going to be difficult, and I am still interested in chemical engineering, but for the next eight years I think I’m going to have to figure something out. If you had to name one person you look up to in sports, who would it be and why? Can I say two? Simone Biles and Serena Williams. They really inspire me because they go above and beyond to prove that they are the best and that they are there because they are the best—especially Serena Williams because she just had her baby but she’s still awesome, so I just admire both of them. Being the first African-American woman to ever qualify for the U.S. Olympic team in speedskating, how do you see yourself as an inspiration to young African-American girls with Olympic aspirations? Coming into [the Olympics] I never ever planned that I’d be an inspiration to anyone. I’m really happy to be an inspiration to everybody, not just African-American girls. I think I direct to them because I am African-American, it’s who I represent, but the main goal is to represent everyone. Being of Ghanaian descent, to what extent do you think that your success in a winter sport may increase popularity of winter sports in Ghana? There was a Ghanaian athlete [who participated in skeleton] at the Olympics, and I think having two winter sport athletes [from Ghana] will broaden the interest because winter in general is not a really popular thing there, and I’m really excited for where the future goes! As an 18-year-old phenom, what is your message to aspiring young athletes? I think the main thing is to be yourself because that’s how I’ve gotten to this level. I took bits and pieces from people, but don’t try to be anyone else. Be yourself throughout everything you do, try to do it in your own way, and don’t ever give up. Just love something so much that you set a goal and achieve it!